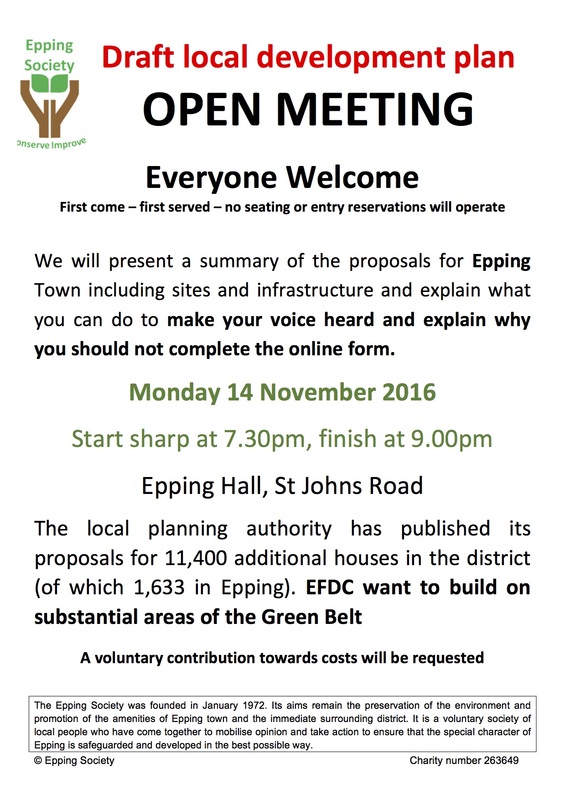 The Epping Society will hold an open meeting on Monday 14th November at 7.30pm sharp and our invitation is attached. There will be no politics or speeches, just a briefing on what this means to you and what practical steps you can take to make your objections known and what counts as evidence when objecting. Please share this post and make sure your friends and neighbours are aware of this important meeting on the draft local plan for our town and our district. Momentous changes are proposed. If you are able to distribute paper versions of the attached even just to your immediate roads it would help us. We expect to have stock at the weekend and we would like to get them out as soon as possible please contact info@eppingsociety.org.uk if you can assist with distribution ASAP.